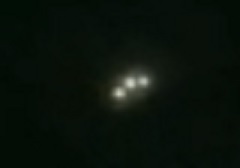 Triangle-shaped craft was filmed over Air Force Base in New Mexico on 8th May. Witness report: at first two orange yellow lights just stationary In the sky then a third appeared in a triangle like formation. driving home from work on base, and casually glanced to my right (south) and noticed two orange yellow lights floating and casting a lot of light on the ground between 1 & 7 miles away. I pulled over to look closer and as I was recording with my phone a third appeared in a triangle formation with with the other two. they did not appear to move or fall I heard no audible noise. i know it was not flares from anything cause they were stationary and the only thing in the direction i was looking was open desert.nor was it an aircraft. after i observed for around 5 minutes they all just disappeared within quick succesion.